This year I will have a special vacation with just the dogs in Sweden! We are going by car all the way to Lappland! On the way we meet up with my two sisters and we drive all together. To Stockholm Yatzie and Moët will have the luxury of having the whole rear of the car to themselves - softly sleeping on their pillows! They are so easy to bring along in the car. They relax and are happy with a break every three hours or so. Then in the evenings, when we arrive to our different destinations, they get their exercise! 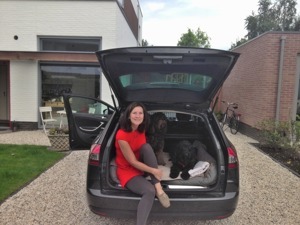 Here we are just ready to take off to destination 1 - Fyn in Denmark where Vera lives!